Ricinocarpus pinifolius is local to the Sydney region and should be on everyone’s ‘must have’ list for their garden. I planted this plant about 10 years ago in my garden, in the northern Sydney suburb of Westleigh and it is now approximately two metres high and produces flowers from September to well into December. It is growing in a slightly raised bed over a clay sub soil and receives little additional watering from me. 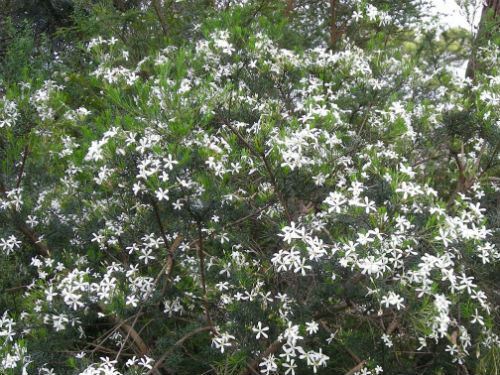 Massed flowers are clustered around the ends of the branches and appear to cover the entire bush. 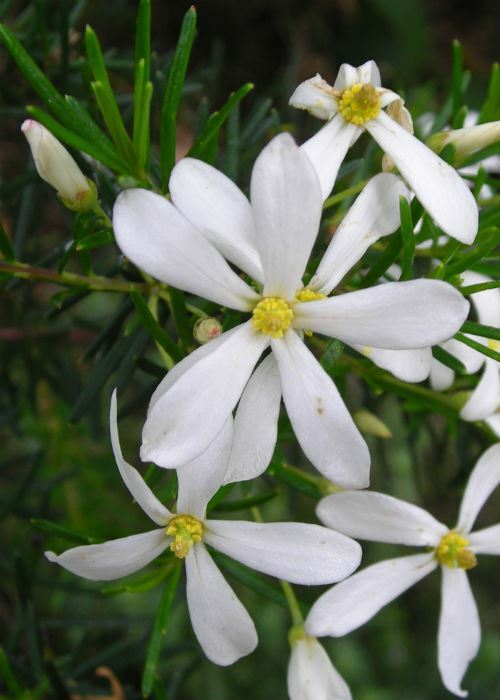 Each flower has five white petals, 10 to 15mm long. The male flowers have a centre of yellow anthers while the female flowers have a pale green ‘ball’ in the centre (the ovary). The plant produces more male flowers than female and this provides for a more interesting overall visual display. Ricinocarpus: from the Latin retortus meaning caster oil plant and Greek carpos meaning fruit. The fruit resembles that of the castor oil plant- Ricinus. Pinifolius: from the Latin pinus meaning pine and folium means leaf.